Mothers are our pillars strength. Whether it is helping you with your homework, assisting you with your career choices or encouraging you to put your best foot forward, mothers will always be there to support you and give a handy piece of advice. With Mother’s Day around the corner, it is the right opportunity to thank your mother for the endless support and love that you always received. Managing a perfect balance between work and home is not cakewalk. This Mother’s Day, why not surprise your mom with some smart home appliances that will make their work easy? The blog lists some handy home appliances that are worth the money you spend. Read on. Noodles and pasta have become a part of our lives. However, ready made noodles and pastas are laced with preservatives which do more harm than good. Every mother, being health conscious, would always prefer preparing something healthy at home rather than order out. Taking into consideration this factor, KENT Noodle and Pasta Maker are an ideal gift for all health conscious mothers. The kitchen appliance helps in preparing different varieties of pastas, noodles and momos without much hassles. Kneading atta is time taking and may at times be tiresome. With the introduction of Atta Maker, it has become easy to knead atta without any hassles, which makes it an ideal Mother’s Day gift. All you need to do is put the ingredients in the machine and the dough will be ready within minutes. Apart from this, you can also make dough for different types of breads. Fresh fruit and vegetable juices are a necessity during breakfast. To make your mom’s work easy, gift a juicer that makes it easy to extract different types of juices, especially during rush hour. If you are health conscious, you can also opt for cold-pressed juicers. You can get KENT Cold Pressed Juicer operate quietly, extract more juice and also retain the natural taste and nutrients of the fruits and vegetables. Rice is a part of our everyday diet. The appliance makes it easy to cook rice and other steamed items without any hassles. The automatic devices make it easy to prepare your favorite dishes without any manual intervention. Although the device is called rice cooker, it can also be used for a number of other purposes such as steaming, preparing dalia and soups. Nothing can beat a healthy smoothie for breakfast every morning. If your mom makes it a point to start the day with a healthy and filling breakfast like smoothie, a blender is an ideal gift this Mother’s Day. 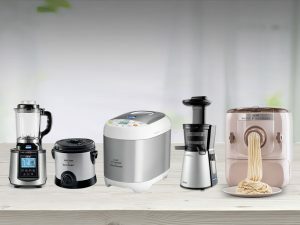 In addition to preparing healthy smoothies, the blender can also be used for a number of other purposes such as making homemade sauces, whipped cream, lemonade and soups. Gone are the days when flowers and chocolates were the only gift options available for special occasions like Mother’s Day. The automated devices from KENT will help your mother with the daily household chores with ease. The automatic devices don’t need manual intervention which makes these appliances a great addition in the kitchen.